Arrest and trial On December 29, 1863, Dodd was stopped by a Union sentry in west Little Rock, near Ten Mile House on Stagecoach Road, and was discovered to be without a pass. For identification, he showed his small leather notebook, where Union soldiers found his birth certificate and a page with dots and dashes. A Union officer was able to read some of the Morse code messages, which contained information about Union troop strength and locations in Little Rock; Dodd was arrested. The next day, Dodd was taken to Little Rock to face Brigadier General John Davidson, who was commanding the Union occupation forces in General Frederick Steele's absence. A telegraph operator translated the Morse code, which provided precise locations and strengths of Union troops. David was formally charged as a spy and was taken to the military prison on the site of the present Arkansas State Capitol building. Dodd was interrogated for two days by Union officers who tried to discover the source of the information. On the third day, under personal orders from General Steele, Mary Dodge and her father were escorted under armed guard to a Union gunboat on the Arkansas River and transported to Vermont, where Mary was kept until the end of the war. This suggests that Steele had discovered that Mary Dodge was involved, and that he would not be able to hang a 16-year-old girl. On December 31, 1863, Dodd's trial began in Little Rock by a military tribunal of six Union officers. Brigadier General John M. Thayer presided with Captain B. F. Rice as Judge Advocate. Other members were Colonel John A. Garrett, Major Phineus Graves, Major H. D. Gibson and Captain George Rockwell. The Court Martial lasted four days. "In this, that said David O. Dodd, an inhabitant of the State of Arkansas, did as a Spy of the so-called Confederate States of America, enter within the lines of the Army of the United States, stationed at Little Rock, Arkansas, and did there secretly possess himself of information regarding the number, the kind, and position of the troops of said Army of the United States, their commanders, and other military information valuable to the enemy now at war with the United States, and having thus obtained said information did obtain a pass from the Provost Marshal General's office, and endeavor to reach the lines of the enemy - therewith; when he was arrested at the cavalry outposts of said Army - and did otherwise lurk, and act as a spy of the Rebels now in arms against the United States - This at the Post of Little Rock, and the encampments of the Army of Arkansas, on or about the 29th and 30th of December, 1863." To these charges, David pleaded "Not Guilty". On January 1, 1864, the trial continued with Dodd represented by attorneys T. D. W. Yonley and William Fishback, who was pro-Union and later became Governor of Arkansas. The defense attorneys proposed amnesty, which was rejected by the tribunal after an adjournment to deliberate the matter. Court was adjourned until the next day. On January 2, 1864, witnesses were called to testify against Dodd. Private Daniel Goldberg testified that he tore up Dodd's pass because "he did not need a pass anymore". Sergeant Frederick Miehr testified that he arrested Dodd after the boy could not produce a pass. 1st Lieutenant C. F. Stopral found Dodd's memoranda book, discovered that the Morse code reported the positions and armaments of the 3rd and 11th Ohio Batteries, and sent him to the guard house. Captain George Hanna testified that he interrogated Dodd, and discovered that Dodd was carrying one pocketbook containing Louisiana money, Confederate money, ten dollars in greenbacks, and some Confederate postage stamps; one postal currency holder, one loaded Deringer pistol, and a package between his shirts containing letters. Captain John Baird testified that, per Hanna's orders, he took the prisoner and the papers into Little Rock the next morning to General Davidson. Captain Robert C. Clowery testified that he interpreted the Morse code as containing detailed information about the locations and strengths of Union forces and armaments. First Lieutenant George O. Sokalski then testified about the actual Union troop strength and weaponry, which was a match of Dodd's coded message. During the trial, Dodd was asked several times to name the Union traitor who gave him the troop information; each time he remained silent. The defense tried to explain the Morse Code information as something Dodd did to exercise his telegraph skills. Dodd did not testify, although his written deposition was submitted. Only character witnesses were called. By a 4–2 vote, David Dodd was convicted of spying for the Confederacy and was sentenced to be hanged. He was taken back to the State Prison. General Steele designated Friday, January 8, 1864 for the execution day. During the Civil War, seventeen-year-old David Owen Dodd of Little Rock (Pulaski County) was hanged as a spy by the Union army. 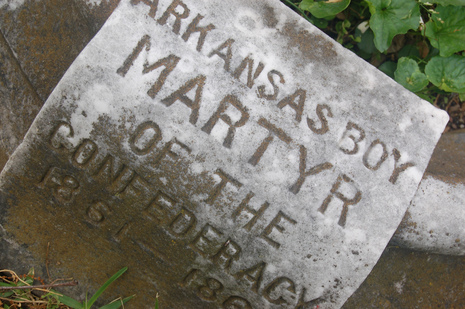 He has been called the “boy hero of Arkansas” as well as “boy martyr of the Confederacy.” His story has inspired tributes such as the epic poem The Long, Long Thoughts of Youth by Marie Erwin Ward, a full-length play, and even reportedly a 1915 silent Hollywood movie, which has not survived. Historical markers, monuments, annual reenactments of his execution, and the naming of the David O. Dodd Elementary School in southwest Little Rock are among the state's recognitions of his life and death. David Owen Dodd was born on November 10, 1846, in Lavaca County, Texas, to Lydia Echols Owen Dodd and the merchant Andrew Marion Dodd; he had two sisters, Leonora and Senhora. They moved to Little Rock to be closer to Senhora’s school, and young Dodd attended St. Johns' College, located on the grounds of present-day MacArthur Park. After less than a year, Dodd left St. John’s when he became ill with malaria, but he hoped to return. Meanwhile, he worked as a clerk and learned Morse code at the telegraph office.